What Is A Cervical Injury? 1 What Is A Cervical Injury? The cervical vertebrae are the seven bones in the neck (C1-C7) between the thoracic vertebrae (upper back) and head. This area of the body contains muscles that protect the vertebrae and associated nerve roots. 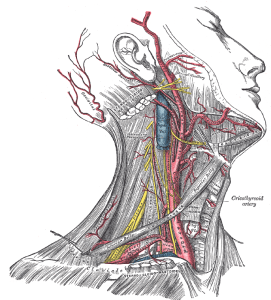 Cervical injuries can affect the muscles, nerves, and vertebrae of this region. These types of injuries can occur in athletes, car accident victims, or anyone who has undergone some form of acute neck strain or stress. Injuries to the cervical and thoracic spine can lead to neurological problems. One such type of cervical injury is a brachial plexus injury, which make up approximately 10% of all cervical spinal injuries. These occur as a sudden compression or elongation of one side of the neck, and are particularly common in sports-related injuries. The injury is accompanied by a burning sensation along with tingling, numbness, or weakness extending through the shoulder and down the arm on the affected side. Cervical injuries may also occur in the form of an acute injury or sprain. In this case, there may have been an event that jammed the neck, such as a head impact. The injury may also be directly related to damage caused to a cerebral vertebra, such as a fracture, or it could be due to damage to a cervical disc that has become damaged or herniated. Lastly, cervical spinal stenosis, or the narrowing of the spinal canal in the neck region, may also contribute to a cervical injury. Cervical injuries result from strained neck muscles and injuries to the neck. This can affect any number of muscles in the neck, including the trapezius, erector spinae, rhomboids, scalenes, the levator scapulae, and sternocleidomastoid (SCM) muscles. All head injuries carry a risk of cervical injury. Sports, such as football, carry a risk of this type of injury with up to two-thirds of college football players experiencing this type of injury. Assessment of sport-related cervical injuries is critical in determining whether to allow a player to reenter the field. Cervical injuries related to the skeletal structure of the neck may be caused by fractures. These fractures result from the sudden forceful trauma experienced as a result of a vehicle accident, a hard fall, head-to-head collisions in sports, or any action that causes a sudden change in movement to the neck. In the most severe cases, further injury may result from fragments of a broken vertebra putting pressure on the spinal cord itself. If this happens, then there is a risk of severe and permanent nerve damage resulting in paralysis or death. Degeneration or herniation of vertebral discs may lead to cervical injury. As the vertebral discs wear down due to age or excessive strain, they can begin to bulge out from between the vertebrae. These bulging, or herniated, discs can crowd the spinal cord, the nerve fibers coming out of the spine, or the surrounding tissues. Cervical injury resulting from cervical spinal stenosis is most often a result of aging. Stenosis is a narrowing of the spinal canal that can be caused by long-term wear and tear of associated spinal tissue, such as vertebral discs. As these discs wear down and can no longer absorb the impact and friction for the adjacent vertebrae, the vertebrae become damaged and a patient may experience excess bone growth. This bone growth then crowds the spinal cord and exerts additional pressure on the associated nerves. Depending on the cause of the cervical injury, many treatment options exist. Cervical injuries may result from a damaged muscle causing soreness and stiffness or from an acute or sustained injury to the nerves of the neck. These injuries can arise from strain, fatigue, sports, automobile accidents, poor posture, age-related degeneration, or a fractured vertebra. Initial treatments may include rest with over-the-counter medications such as non-steroidal anti-inflammatory drugs (NSAIDs) and, if the pain from a cervical injury persists, a physician may suggest prescription pain relievers, steroid injections, nerve blocks, neck braces, or surgery. For patients whose injury involved muscle strain, muscle strengthening and physical therapy are likely treatment options. Weak muscles can lead to fatigue and excessive motion of the cervical spine. Poor muscle tone can also contribute to cervical injuries by not providing enough support for regular activities. The fatigue caused by weak muscles can also contribute to poor posture. Exercise can help strengthen the muscles while physical therapy can be a useful treatment for correcting bad habits that led to the initial cervical injury. For patients experiencing an acute cervical injury, the resulting damage will determine the best treatment options. If the initial injury results in muscle strain, then treatment options will be similar to those mentioned above. If the injury results in a herniated disc, then a steroidal injection may be able to bring rapid relief to the disc and associated nerves by reducing the inflammation of the region. When these injections are insufficient, nerve blocks and surgical removal of disc material are additional treatment options. For cervical injuries resulting from arthritis or age-related disc degeneration, it may be more difficult to find a long-term solution. Preventing age-related bone loss (osteoporosis) can be used as a prophylactic treatment to help prevent cervical injuries related to fractured vertebrae. Arthritic symptoms can be treated with anti-inflammatory medications, either over-the-counter or as prescribed by a physician. If disc degeneration is identified as a causative factor, treatments range from anti-inflammatory medications to surgical removal of disc tissue that may be putting additional pressure on the associated nerves. Cervical injuries broadly include any injury to the vertebrae, muscles, or nerves at the back of the neck. These injuries may be acute injuries, injuries due to chronic wear and tear, or age-related degeneration. Neck strain, weak muscles, and poor posture may all contribute to a person’s chance of sustaining a cervical injury. Treatments vary by the type and cause of the cervical injury. Treatment options include anti-inflammatory medications, nerve blocks, physical therapy, or surgery. Consult your physician for help in evaluating your particular cervical injury and to develop the best treatment plan for you. El-Faramawy A, El-Menyar A, Zarour A, Maull K, Riebe J, Kumar K, Mathew J, Parchani A, Al-Thani H, Latifi R. Presentation and outcome of traumatic spinal fractures. Journal of Emergencies, Trauma and Shock. 2012;5(4):316-320. Kepler CK, Vaccaro AR. Injuries and abnormalities of the cervical spine and return to play criteria. Clinical Sports Medicine. 2012;31(3):499-508. Nazir M, Khan SA, Raja RA, Bhatti SN, Ahmed E. Cervical spinal injuries in moderate to severe head injuries. Journal of Ayub Medical College, Abbottabad. 2012;24(3-4):100-102. Rihn JA, Anderson DT, Lamb K, Deluca PF, Bata A, Marchetto PA, Neves N, Vaccaro AR. Cervical spine injuries in American football. Sports Medicine. 2009; 39(9):697-708. Tian HL, Guo Y, Hu J, Rong BY, Wang G, Gao WW, Chen SW, Chen H. Clinical characterization of comatose patients with cervical spine injury and traumatic brain injury. Journal of Trauma-Injury Infection & Critical Care. 2009;67(6):1305-1310.